I weighed myself this morning and... I lost 3 more pounds! I've had a good day today (meaning I wasn't overly hungry). Before leaving for work this morning, I drank 10 ozs. 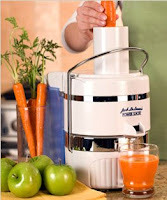 of freshly extracted juice (carrots, celery, tomato and apple) and took my Pops. My tummy growled a couple of times (once mid-morning and another time this afternoon) but it was a lot better than yesterday. And my hunger wasn't so great that I felt the need to chew any gum. On my lunch break, I drank a glass of grape juice and for dinner tonight, Paul and I will drink another glass of freshly extracted juice. The Biggest Loser comes on tonight so hopefully, I'll get to watch it. My toddler, Brady, isn't ready to go to sleep until after 8pm, so I usually miss some of the show while putting him down for the night. Congrats on your progress so far. I'll keep checking in so I can get my much needed dose of inspiration. Congratulations!!! I am very proud and excited for you. I don't know if I could just juice-I want to I just don't know if I have it in me. Heidi - Thanks! It's not easy but it's doable. I have some links on my Oct. 6 post about juice fasting if you want to read more about it. Please feel free to email me if you have a question you'd like to ask. A fast is great for breaking any kind of addiction (as you know, junk food is mine). I've done 30 days before but not 40. Hopefully, I can pull it out. I believe fasting is the best thing you can do for your body and juice fasting is great because you're still getting fed. Thanks for stopping by! Health Nut Wannabee Mom - Hey there Heidi! Thanks for the kind words. It's not easy but like I said above, it's doable. Having only juice like killing me. However, it's worth to do. Congratulations! Congrats! That is some major dedication. I'm not sure if I can do that. Maybe I'll start off small (maybe 7 days) and then work my way up. Angel - Thanks! I recommend you start off small. First do a one day fast. Eat normal for a few days then when you're ready, do a three day fast. Take another break and then when you're ready, do a seven day fast. I have some helpful links at the bottom of my post titled "Breaking the Chains of Food Addiction - Starting A Fast".